Over two years have passed since Russia introduced an embargo on Western food imports in retaliation for Western Sanctions. 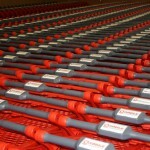 The embargo has permanently changed the production of food and consumers behavior in Russia. Even if – which is unlikely – the Russian embargo is lifted, the exporters of food to Russia will probably find a completely different market. The effects of the Russian embargo have so far been considered mainly from the point of view of the countries to which it applies, while its impact on the situation in Russia has usually been overlooked. This leads us to the question of how the sanctions against Western food have affected the agricultural and food sector in Russia and the Russian consumers. In August 2014, Russia banned food products from the European Union, USA, Canada, Australia and Norway in response to Western sanctions imposed on Russia due to the annexation of Crimea. In August 2015, the embargo was extended to include Albania, Montenegro, Iceland and Liechtenstein. 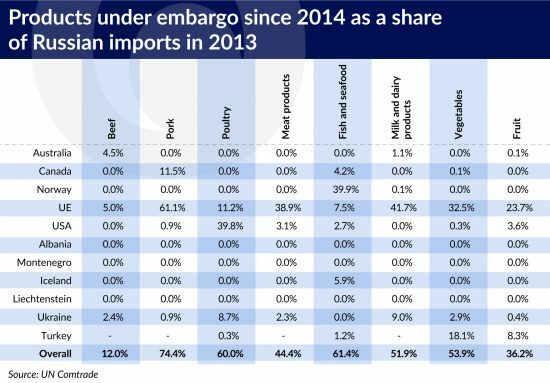 From January 2016, Ukraine and Turkey were also included in the list of countries covered by the Russian food embargo (in October 2016 the embargo on Turkish food was relaxed slightly). As a result, in the years 2014-2016 Russia closed its market to countries that in 2013 accounted in total for more than half of Russian imports of pork, poultry, fish and seafood, vegetables and dairy products. Why an embargo on food? At the beginning of 2010, Russia adopted the Food Security Doctrine aiming to reduce the country’s dependence on the imports of agricultural and food products. The document resulted in the adoption of the “Agricultural Development Program 2013-2020” in July 2012. Pursuant to this plan Russia has created a system of subsidies and direct payments dedicated to the priority branches of the Russian agricultural and food sector. Government funds in the amount of RUB2.28 trillion (current value: EUR30.4bn) have been allocated for this purpose. The document also indicates the minimum levels of production and the self-sufficiency ratios (the share of domestic production in domestic consumption) for the basic types of food, that Russia is supposed to reach by 2020. 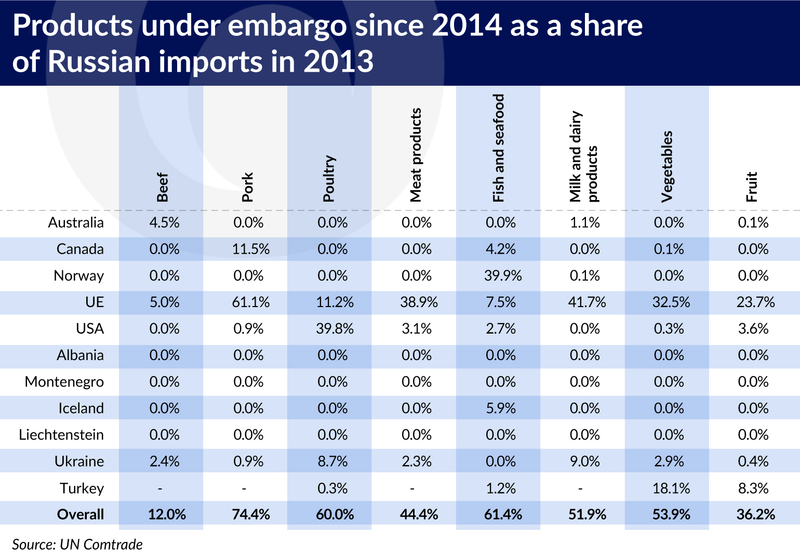 Before the introduction of the embargo in 2014, Russia most strongly depended on the imports of fruits (domestic production covered less than 40 per cent of consumption), meat and meat products, fish and seafood, milk and dairy products (approx. 80 per cent) as well as vegetables (approx. 90 per cent). Meanwhile, in the case of agricultural commodities such as cereals, potatoes or oil plants (except for soy) Russia was a net exporter or its dependence on imports was small. This means that the Russian embargo on Western food was applied to the agricultural and food products the least accessible in Russia. At the same time, the wide geographic scope of the embargo covering the key food exporters in the world makes it impossible for Russia to fully compensate for the shortages with increased imports from other countries. The emergence of significant deficits in the Russian food market constitutes an impetus for the growth of domestic production, protects domestic producers against foreign competition and forces Russian consumers to switch to local food. It is therefore consistent with the objective of increasing the food self-sufficiency included in the Food Security Doctrine, the achievement of which would be difficult amid free foreign trade, because of the low relative competitiveness of Russian agriculture. Such assessment was supported in the justification for Russia’s decision from June 2016 on the extension of the sanctions until the end of 2017. In accordance with this decision the sanctions will allow “to plan in advance for the investments in the national agricultural and food sector, which is reluctant to see the return of the Western competition”. We can therefore expect that the lifting of the embargo in the coming years is highly unlikely, and will probably only take place when Russia reaches the established goals related to food security. 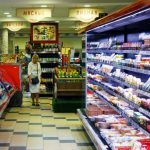 The closing of the Russian market to Western agricultural and food products amid limited possibilities for a quick increase of domestic production capacities and the strong depreciation of the ruble has led to a significant increase in food prices. During the first two years of the embargo (that is from August 2014 to July 2015 and from August 2015 to July 2016) the average annual inflation rate in the category of “food and non-alcoholic beverages” amounted to, respectively, 18.1 per cent (y/y) and 11.0 per cent (y/y), compared to 6.9 per cent (y/y) in the year preceding the embargo (i.e. from August 2013 to July 2014). 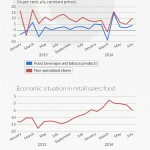 Among the food products covered by the embargo during the two years, after it went into force, the strongest price increase was recorded for fish and seafood (in August 2016 their prices were 42.6 per cent higher than in August 2014), fruits and vegetables (+36.0 per cent) and dairy products (+21.2 per cent). As a result, the overall consumer prices in August 2016 were 23.6 per cent higher than in August 2014. The strong increase in inflation combined with the economic crisis and the deterioration of the situation on the labor market led to a decrease in the real disposable incomes of the population, which, according to data from Rosstat, were approx. 5 per cent lower in 2015 than in 2013. The impoverishment of the society was reflected in the changing patterns of food consumption in Russia. According to data from Rosstat, in 2015 the consumption of fruits, milk and dairy products, meat and sugar was lower than in 2013 (the last full year without the embargo), while an increase was recorded in the consumption of vegetables and potatoes. At the same time, the consumption of bread and eggs has not changed. The changes in the structure of food consumption therefore reflect an increase in the share of relatively cheap products in the diets of Russians, and a decline in the share of more expensive products. This assessment is additionally supported by the estimates of the company Euromonitor, according to which in recent years there has been an increase in the consumption of the relatively cheap poultry at the expense of a significant decline in the consumption of beef. 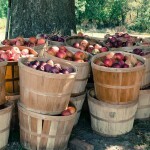 At the same time, the shortage of some agricultural and food products, the impoverishment of the society and the lack of competition from Western manufacturers has led to the mass counterfeiting of products and the emergence of significant discrepancies between their labels and the actual composition of the products. According to the estimates of the Rosselkhoznadzor (the Federal Service for Veterinary and Phytosanitary Surveillance) the most frequently counterfeited group of products are dairy products, in which palm oil is used on a mass scale instead of milk, as well as canned goods. In response to the significant increase in counterfeiting and falsification of product labels, the Rosselkhoznadzor began publishing a list of honest companies, which do not mislead the consumers. The mass falsification of food has also affected the way in which Russians shop for groceries. According to the results of a study conducted by the company Nielsen, private labels of large retail chains, which guarantee competitive prices and quality, are gaining popularity. There is also an increase in the consumption of traditional Russian food products, which are based on local ingredients and do not require the import of foreign components. The closure of the market to Western food and the implementation of the Agricultural Development Program became a strong impulse for the growth of the Russian agricultural and food industry. At the same time, however, many previously unforeseen factors have emerged, leading to a slowdown in its development. Firstly, the strong depreciation of the ruble has led to an increase in the prices of foreign machinery, technology and other goods used in the agricultural and food production. The availability of Russian replacements is limited in the case of many of these items, which significantly increased the cost of modernization and the expansion of the productive capacity of the Russian agricultural and food industry. Secondly, in response to the strong depreciation of the ruble and the growing inflation, the Central Bank of Russia has significantly increased the interest rates. As a result, there was an increase in the cost of loans, which limited the possibilities for the acceleration of investment in the agricultural and food industry. Thirdly, according to media reports, there are serious delays in the disbursement of funds as part of the government support schemes, which hampers the implementation of investment and the planning for further development based on government support. Fourthly, the impoverishment of the society has led to a decline in demand for the relatively expensive goods in short supply, thereby reducing the benefits from the lack of Western competition on the market. According to the estimates of USDA (United States Department of Agriculture), the strongest production growth among the product groups covered by the embargo was recorded in the poultry sector (+24.6 per cent in the years 2013-2016). The higher production of poultry was stimulated by the strong domestic demand for this type of meat resulting from its relatively low price. The development of this industry is also promoted by its high consolidation (the top 10 manufacturers account for approx. 40 per cent of the overall production), as well as the modern production base (approx. 60 per cent of the production comes from plants built or fully modernized after 2008). Strong growth was also recorded in the case of pork (+15.4 per cent in the years 2013-2016). In this case the effects of scale (20 largest plants account for approx. 60 per cent of the overall production) have a favorable effect on the development of the industry. Moreover, the numerous cases of ASF (African Swine Fever) in Russia are conducive to an accelerated consolidation and the exit of the smallest manufacturers from the market. 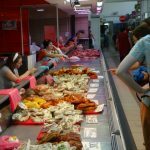 Despite the higher price (as compared with poultry), the demand for pork is also driven by its traditional role in the Russian cuisine. Meanwhile the embargo has particularly impacted the beef industry (decline in production by 3.2 per cent in the years 2013-2016). Up until now beef production in Russia has mainly been a by-product of the dairy industry. At the same time, it is characterized by very strong fragmentation, which significantly hampers any investment aimed at increasing the productive capacity. Moreover, along with the deterioration of the economic situation of the residents, the demand for beef (which is significantly more expensive compared to other types of meat) collapsed, which further limited investment. A decrease in production (by 1.5 per cent) was also recorded in the dairy industry, where the highly fragmented raw materials base remains the main barrier to development. In the case of fruit and vegetables, the growth of their production is inhibited by the characteristics of the Russian market. According to USDA estimates , approx. 64 per cent of the Russian supply of fruits and 70 per cent of the Russian supply of vegetables comes from small farms, home gardens and allotments, and as a result remains outside the modern retail channels. The high fragmentation and lack of specialization are not conducive to production efficiency either. An additional strong barrier is the lack of adequate infrastructure for storage and transportation of fruits and vegetables, resulting in oversupply during the harvest season and shortages after the season. Nevertheless, the growing investment expenditures in the industrial production of fruits and vegetables may lead to an increase in output in the coming years. 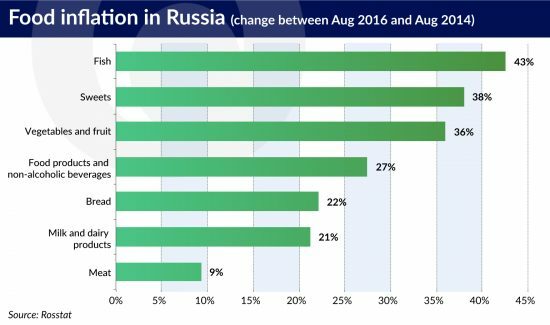 The isolation of the Russian market did not significantly help the fish industry either. The development of mariculture (the farming of marine organisms) is very slow due to the insufficient level of investment in the industry which requires large capital outlays. As a result, the industry is struggling with a shortage of modern equipment, production technologies and specialized feed. At the same time, in 2015 the largest private companies suffered significant losses due to the outbreak of fish epidemics that affected their plants. It is worth noting the growing interest of Asian companies in investing in the Russian agricultural and food industry. The Vietnamese dairy company TH Group will invest USD2.7bn in the construction of a dairy farm near Moscow. The Thai company Charoen Pokphand Group will also invest in milk production near Moscow, with the help of Chinese investors. We can expect that in the coming years Asian companies will take advantage of the absence of Western competition and increase their presence on the Russian market. 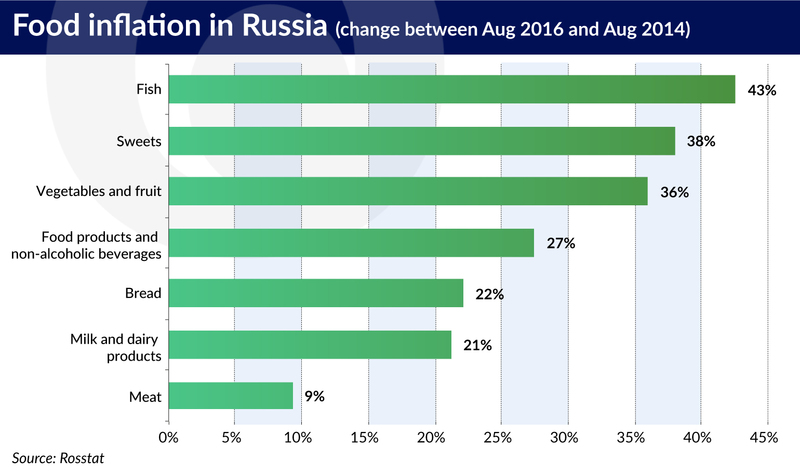 Data from the last two years indicate that in the short term the embargo imposed by Russia on Western food turned out to have a negative effect on the Russian agricultural and food industry and Russian consumers. At the same time, the continued maintenance of sanctions and public support does not guarantee that Russia will achieve self-sufficiency in all the types of agricultural and food production identified in the Food Security Doctrine. It is also worth mentioning the cumulative cost of the isolation of the Russian market, namely the reduced prosperity associated with lowered consumption. Moreover, the question arises whether the current investments in the industry, which are made amid strong government support and lack of western competition, will remain profitable in the event of the possible lifting of the embargo in the future. Regardless of the answer to this question, we can expect that due to the long duration of the sanctions, profound changes will have occurred in the patterns of food consumption in Russia. Thus, as Bulat Okudzhava sang, “The past is not coming back and there is no use crying over spilled milk”, after the possible lifting of the embargo Western exporters are likely to encounter a completely different market than the one they remember from the summer of 2014. Jakub Olipra is a PhD student at the Collegium of Economic Analysis of the Warsaw School of Economics, and an economist at Credit Agricole Bank Polska.